Walden C. “Wally” Rhines (born November 11, 1946) is an American engineer and businessman. Rhines is President and CEO of Mentor Graphics, a Siemens Business and previously worked as an executive at Texas Instruments. Rhines was named overall CEO of the Year by Portland Business Journal in 2012 and Oregon Technology Executive of the Year by the Technology Association of Oregon in 2003. He was named an IEEE Fellow in 2017. Rhines was born in Pittsburgh, Pennsylvania. His father, Frederick N. Rhines, was the Alcoa professor of light metals at the Carnegie Institute of Technology from 1946-1959 and founder of the department of materials science and engineering at the University of Florida, from which he retired in 1978; today the department is housed in Frederick N. Rhines Hall. Rhines earned his bachelor of science in engineering (BSE) from the University of Michigan in 1968 and his master’s degree and Ph.D. in materials science and engineering from Stanford University in 1970 and 1972, respectively. He earned his M.B.A. from Southern Methodist University in 1975. "Moore’s Law will indeed become irrelevant to the semiconductor industry. But the remarkable progress in reducing the cost per bit, and cost per switch, will continue indefinitely, thanks to the learning curve. And with it, the number of new applications for electronics will continue to be limited only by the creativity of those who search for solutions to new problems." —Walden C. Rhines, 2016. From a Scientific American guest blog post, Moore's Law and the Future of Solid-State Electronics. While at Stanford, Rhines co-invented the magnesium-doped gallium nitride blue light-emitting diode, for which he, Herb Maruska and David Stevenson were awarded a U.S. patent in 1974. Isamu Akasaki built directly on this gallium-nitride research and eventually won the 2014 Nobel Prize in Physics, along with Hiroshi Amano and Shuji Nakamura. Rhines worked at Texas Instruments (TI) from 1972 to 1993, serving as executive vice president of the semiconductor group and president of the data systems group. While at TI, Rhines supervised development of speech synthesis chips used in the Speak & Spell; developed the first publicly available computer program (for a calculator) to calculate the Black-Scholes value of a stock option; and supervised the creation of the TMS320 digital signal processor. In a 1985 profile of Rhines in the Austin American-Statesman, industry consultant Will Strauss told reporter Russell Mitchell: "He [Rhines] can claim the TMS-320 digital signal processor chip; that's the one to beat on the street right now." By 1990, TI's share of the worldwide market for general purpose DSPs was approximately 60%. A January 1991 article in Electronic Business Buyer reported that "[s]ources say that TI has the only profitable general purpose DSP operation in the world." Rhines became CEO of Mentor Graphics in 1993, when the company's annual revenue was about $340 million. The company passed $1 billion in revenue for the first time in 2011. In 2013 Mentor Graphics announced it would begin paying a quarterly dividend, making it the only of big three electronic design automation (EDA) companies to do so; (Cadence Design Systems and Synopsys are the other two). Rhines has led the company into new business areas, including providing software for the auto industry; of the big three EDA companies, analyst Tom Diffely said "Mentor has the most going on in these adjacent markets...I think (the auto industry) is going to be a long-term huge market for them." Rhines has been elected five times (1996, 2002, 2004, 2008, 2010) to serve two-year terms as chair of the Electronic Design Automation Consortium, the international trade association for the EDA industry. He is a board member of TriQuint Semiconductor (1995–2015), QORVO (2015–present) and the Semiconductor Research Corporation (2002–present). Previously he has served on the boards of Cirrus Logic (1995–2009), the Global Semiconductor Alliance (2007–2010), Global Logic Inc. (2014–present) and the Computer and Business Equipment Manufacturers Association, now known as the International Committee for Information Technology Standards (1984–1987). From 1996-2005 Rhines was a trustee at Lewis & Clark College, where he remains a life trustee today. 2014: Distinguished Eagle Scout Award (he became an Eagle Scout in 1964). 2015: Phil Kaufman Award for his contributions to the EDA and IC design industries. Rhines, Walden (22 June 2017). "The Texas Instruments 99/4: World's First 16-Bit Home Computer". Spectrum. IEEE. Retrieved 2 October 2017. Rhines, Walden (22 June 2017). "The Inside Story of Texas Instruments' Biggest Blunder: The TMS9900 Microprocessor". Spectrum. IEEE. Retrieved 2 October 2017. Rhines, Walden C. (14 October 2014). "Nobels Should Celebrate Invention and Optimization". EE Times. UBM Tech. Retrieved 30 October 2014. Rhines, W.C. (2006). "Sociology of Design and EDA". IEEE Design & Test of Computers. 23 (4): 304–310. doi:10.1109/MDT.2006.103. Retrieved 30 October 2014. Rhines, W.C. (2005). "Moore's law is unconstitutional". Proceedings of the 18th International Conference on VLSA Design. IEEE. pp. 31–32. doi:10.1109/ICVD.2005.121. Rhines is listed as a source in books about the evolving semiconductor industry. Nenni, Daniel (2014). Fabless: The Transformation of the Semiconductor Industry. ISBN 978-1497525047. Moore, James F. (2013). Shared Purpose: A thousand business ecosystems, a connected community, and the future. ISBN 978-1490502397. In memory of his father, Rhines endowed a graduate fellowship in Engineering at the University of Michigan in 2016  and a professorship at the University of Florida in 2007. He serves on the board of Classic Wines Auction in Portland, which supports a variety of children and family charities. ^ Fairbairn, Douglas. "Oral History of Walden (Wally) C. Rhines" (PDF). Computer History Museum. Retrieved 29 October 2014. ^ Stevens, Suzanne (6 December 2012). "Gallery: Oregon's Most Admired CEOs". Portland Business Journal. American City Business Journals. Retrieved 17 November 2014. ^ "Portland Business Journal (Twitter feed)". Portland Business Journal. Retrieved 29 October 2014. ^ "Legacy Executive of the Year & Lifetime Achievement Awards". Technology Association of Oregon. Retrieved 29 October 2014. ^ a b "BRIEF-Mentor Graphics CEO Walden C. Rhines named IEEE fellow". Reuters. January 17, 2017. Retrieved April 6, 2017. ^ George, Vander Voort; Francis, Warmuth; Samuel, Purdy; Albert, Szirmae (1993). Metallography: Past, Present, and Future. Philadelphia, PA: American Society for Testing and Materials. p. 73. ISBN 0-8031-1484-2. Retrieved 29 October 2014. ^ "University of Florida Foundation". University of Florida. Retrieved 29 October 2014. ^ a b "Wally Rhines Directory Inventor listing". Directory Inventor. Retrieved 30 October 2014. ^ Rhines, Walden C. (12 April 2016). "Moore's Law and Future of Solid State Electronics". Scientific American. Retrieved 19 May 2016. ^ "Google patent database". USPTO. Retrieved 30 October 2014. ^ "Nobel Prize web site". Nobel Media AB. Retrieved 30 October 2014. ^ Gross, Benjamin (9 October 2014). "How America Lighted the Way for a Japanese Nobel". The Wall Street Journal. Dow Jones & Company Inc. Retrieved 30 October 2014. ^ Corneliussen, Steven (14 October 2014). "Wall Street Journal op-ed disputes physics Nobel achievement's provenance". Physics Today. AIP Publishing LLC. Retrieved 30 October 2014. ^ Patel, Neel (9 October 2014). "Nobel Shocker: RCA Had the First Blue LED in 1972". IEEE Spectrum. IEEE. Retrieved 30 October 2014. ^ Sperling, Ed (10 October 2014). "Who Really Invented the Blue LED". Semiconductor Engineering. SMG. Retrieved 30 October 2014. ^ Maruska, Herbert (13 January 2005). "A Brief History of GaN Blue Light-Emitting Diodes" (PDF). LIGHTimes Online - LED Industry News. Solid State Lighting Net. Retrieved 30 October 2014. ^ Rhines, Walden C. (14 October 2014). "Nobels Should Celebrate Invention and Optimization". EE Times. UBM Tech. Retrieved 30 October 2014. ^ Nenni, Daniel (15 October 2014). "EDA and the Nobel Prize in Physics". SemiWiki.com. SemiWiki.com. Retrieved 30 October 2014. ^ Steinert-Threlkeld, Tom (19 October 1993). "2nd-ranking exec in TI microchip division to become president of Mentor Graphics". The Dallas Morning News. ^ Smith, Nick (19 May 2014). "Interview: in conversation with Walden C Rhines, CEO Mentor Graphics". Engineering & Technology Magazine. The Institution of Engineering and Technology. Retrieved 30 October 2014. ^ "GlobalLogic leadership". GlobalLogic. Retrieved 30 October 2014. ^ Mitchell, Russell (March 17, 1985). "TI 'golden boy' takes another step up". Austin American-Statesman. ^ Strauss, Will (8 July 1991). "Chip fills technology voids". Electronic Engineering Times. CMP Publications, Inc.
^ Burrows, Peter (7 January 1991). "DSP Is Giving All the Right Signals". Electronic Business Buyer. Cahners Publishing Co.
^ Colby, Richard (19 October 1993). "TI Executive to Head Mentor Graphics". The Oregonian. ^ "Dr. Wally Rhines Named President and CEO of Mentor Graphics (TI press release)". www.thefreelibrary.org. Farlex, Inc. Retrieved 30 October 2014. ^ McGrath, Dylan (29 February 2012). "Mentor achieves first $1 billion sales year". EE Times. Retrieved 17 November 2014. ^ Rogoway, Miki (7 March 2013). "Mentor Graphics says it will start paying a quarterly divident". The Oregonian. Retrieved 17 November 2014. ^ Siemers, Erik (30 November 2012). "Mentor Graphics' driving ambitions". American City Business Journals. Retrieved 30 October 2014. ^ "EDA Consortium History & Milestones". www.edac.org. EDA Consortium. Retrieved 30 October 2014. ^ "TriQuint Executives & Leadership". www.triquint.com. TriQuint. Retrieved 30 October 2014. ^ "SRC Milestones". www.src.org. Semiconductor Research Corporation. Retrieved 30 October 2014. ^ "Cirrus Logic Nominates New Independent Directors for Election to Board (press release)". www.cirrus.com. Cirrus Logic. Retrieved 30 October 2014. 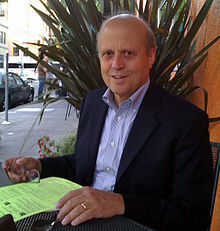 ^ "Mentor Graphics CEO Walden C. Rhines Elected to Global Semiconductor Alliance Board of Directors". news.thomasnet.com. Thomas Publishing Company. Retrieved 30 October 2014. ^ "Business Week Executive Profile: Walden C. Rhines". investing.businessweek.com. Bloomberg Businessweek. Retrieved 30 October 2014. ^ "Lewis & Clark, Board of Trustees, Life Trustees". www.lclark.edu. Lewis & Clark College. Retrieved 30 October 2014. ^ "Nottingham Trent University Honors Mentor Graphics President and CEO, Walden Rhines". www.prnewswire.com. UBM plc. Retrieved 30 October 2014. ^ "Semico Awards Prestigious Bellwether Award to Walden Rhines". The Free Library. Farlex, Inc. Retrieved 2 July 2015. ^ "Michigan Engineering, past recipients of the Alumni Merit Awards". University of Michigan. Retrieved 30 October 2014. ^ "Mentor's Walden Rhines and Intel's Paolo Gargini Receive IEC Fellow Awards at DesignCon 2009". iconnect007.com. I-Connect007. Retrieved 30 October 2014. ^ "Boy Scouts of America, Cascade Pacific Council, 2014 Eagle Scout Celebration". BSA, CPC. Retrieved 30 October 2014. ^ "EDA Industry Recognizes Dr. Walden C. Rhines of Mentor Graphics with the 2015 Phil Kaufman Award" (PDF). EDAC. Retrieved 9 September 2015. ^ "UF Extends Highest Honor to Wally Rhines". Herbert Wertheim College of Engineering, University of Florida. University of Florida. Retrieved 16 May 2016. ^ McKenley, Hannah. "Frederick N. Rhines Fellowship Fund established". The Michigan Engineer News Center. University of Michigan. Retrieved 25 September 2017. ^ "UF Endowed Professorships & Chairs, Frederick N. Rhines Professorship". www.uff.ufl.edu. University of Florida. Retrieved 30 October 2014. ^ "Classic Wines Auction Board Members". Classic Wines Auction. Retrieved 30 October 2014. This page was last edited on 25 July 2018, at 02:00 (UTC).